The floating fountain, also known as lake fountain or aerator, is simply a fountain in a lake to float up and down as the water levels changes, and it is mainly built in large-scale natural lakes as well as various artificial lakes. Because all of its pipes are equipped on the floating box, the operation of the floating fountain is free from the influence of ever-changing water levels. Our floating box is made by welding steel plates or stainless steel panels, and the box has undertaken anticorrosive treatment. In that way, its service lifespan has been prolonged. Even though the manufacture and installation technologies of the floating fountain are quite demanding, it is quite easy and convenient to repair and maintain. It is an ideal device for lakes and ponds where water level fluctuates or where the pond or lake floor is sedimented. And its pump can also be used as temporary displays at parties, events and golf course water hazards. As a professional manufacturer of floating fountain in China, Guangzhou Water Art Fountain Irrigation Garden Co., Ltd also provide many other water fountains, water features and fountain nozzles for clients around the world, including music fountain, programmed animated fountain, garden fountain, square fountain, scenic fountain, artificial fog fountain (mist fountain), laser fountain, waterfall rockery, wall fountain, digital water curtain, creek water feature, indoor water fountain, outdoor water fountain, direct jet nozzle, morning glory nozzle, flower fountain jet, dandelion fountain nozzle, rotary nozzle, flat nozzle, fog nozzle, water sphere and hemisphere nozzle, aerated nozzle, spring nozzle, etc. For all of our products, lifelong maintenance is available. We have built up lifelong cooperative relationship with customers from Malaysia, Brunei, Tajikistan, Saudi Arabia, UAE (United Arab Emirates), and many other countries in Central Asia and Southeast Asia. 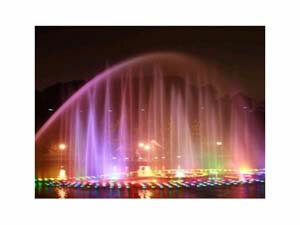 If you need our floating fountain, please do not hesitate to contact us.